Helps prevent sunburn. 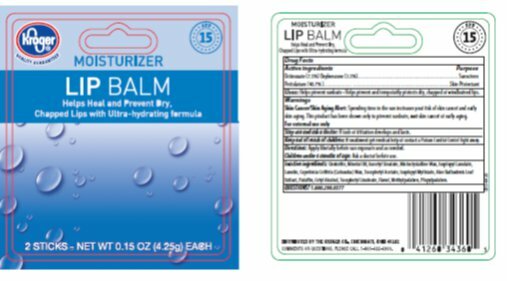 Helps prevent and temporarily protects dry, chapped or windburned lips. Skin Cancer/Skin Aging Alert: Spending time in the sun increases your risk of skin cancer and early skin aging. This product has been shown only to prevent sunburn, not skin cancer or early aging. For external use only: Stop use and ask a doctor: if rash or irritation develops and lasts. Apply liberally before sun exposure and as needed. Children under 6 months of age: Ask a doctor before use. Ozokerite, Mineral Oil, Isocetyl Stearate, Microcrystalline Wax, Isopropyl Lanolate, Lanolin, Copernicia Cerifera (Carnauba) Wax, Tocopheryl Acetate, Isopropyl Myristate, Aloe Barbadenis Leaf Extract, Paraffin, Cetyl Alcohol, Tocerpheryl Linoleate, Flavor, Methylparaben, Propylparaben.